This years Fact Durban Rocks, spread over 15000 square metres of party pleasure, will keep you on your feet from sunset to sunrise. This event will feature the Main Stage and the popular Red Bull Stage. Expect the standard huge sound, lighting, AV and massive bars. Afrotainment will showcase its entire stable of artists including DJ Tira, Big Nuz, Lvovo, Fisherman, Joocy, Bhar, Twitty and the finest lady of house DJ Cndo. The label has cleaned up a few awards in the last year and the “Durban Sound” is fast becoming undeniable with them producing hit after hit. Other artists appearing on the night will be Idols winner Khaya, Zakes Bantwini with full band, Donald I deserve, ProKid, Gagasi Fm and YFM Djs. Gagasi FM will be broadcasting the event live for those of you that can’t make it to Durban. 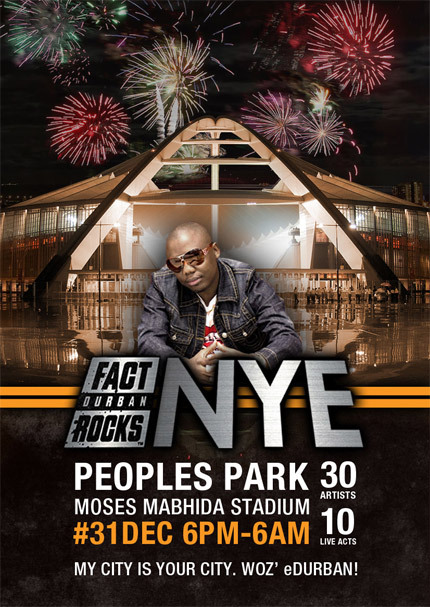 Keep checking our Facebook page www.facebook.com/Factdurbanrocks for more artists that will be added. There will be plenty ways to get your hands on some prizes with our Partners like Gagasi FM, YFM and some newspapers as well. Keep up to date on our “Fact Durban Rocks ” Facebook page or follow us @FactDbnRocks on twitter for all competition details. You can get your tickets from Computicket for R200 (R250 at the door) or R450 for VIP (no door sales for VIP). Please get from proper Computicket outlets as all tickets will be scanned by the stadium scanners. Last year we reached capacity by midnight so we have increased our capacity to 10000 this year. Bars will trade until 4am with a 2hour cool off period, music off by 6am. Please use the cool off period to get something to eat and some water or cool drinks which will still be available. Camp chairs and empty cooler boxes will be allowed but all food and liqour will be sold at the venue.